A Haltom City man was killed and his wife was injured when he lost control of his Harley on I-35W. A Haltom City man was killed and his wife injured when he lost control of his motorcycle Saturday afternoon. 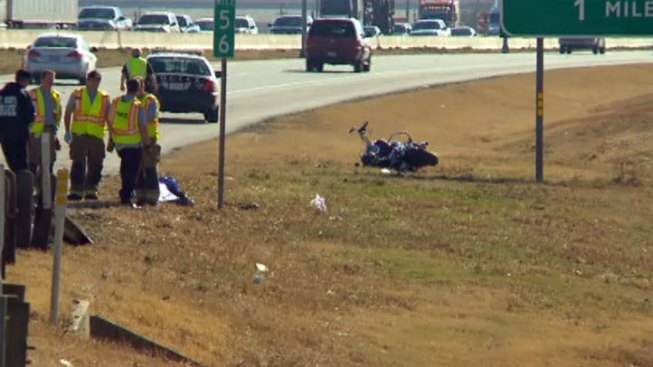 Fort Worth police say it happened on southbound Interstate 35W just south of the exit to Meacham Boulevard shortly before 1:30 p.m.
44-year-old David McKinney lost control of his Harley, hit the right side guardrail and was thrown into a pole. He was pronounced dead at the scene. His 42-year-old wife was also thrown from the motorcycle, she was taken to John Peter Smith hospital with serious but not life-threatening injuries. Police said McKinney was not wearing a helmet.